Our chapter had a great showing at the National ACP meeting in New Orleans, LA. After a long-distance virtual playoff between the team from William Beaumont Army Medical Center and Walter Reed National Military Medical Center, our Chapter Doctor's Dilemma winning team was settled. CPT Carlie Cerne, CPT Natalie Mitchell and CPT Joseph Maciuba from Walter Reed National Military Medical Center would represent us in the National competition. They had an amazing first round, finishing with enough points to advance to the semifinals. 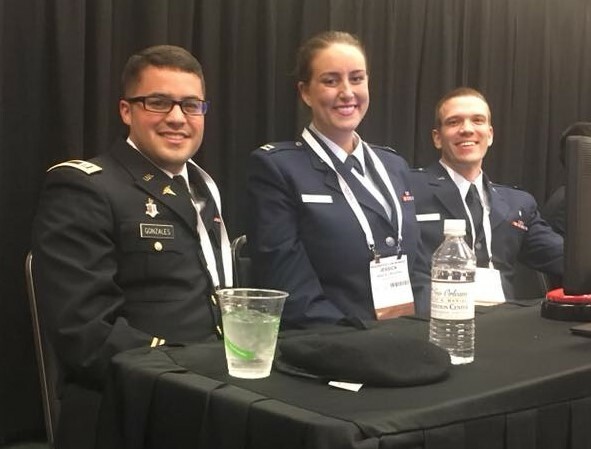 The combined Army/Air Force team from SAUSHEC, CPT Paul Gonzales, Capt Jessica Brumble and Capt Robert Hall, representing the Texas Southern Chapter, also advanced to the semifinals. Despite outstanding performances in their semifinal rounds, neither team scored enough points to advance to the final. That being said, this marks the fourth straight year our Chapter team advanced to the semifinals, which means our chapter, and our residency programs, consistently produce top 20 teams! For the third consecutive year, the Ohio Chapter co-hosted a reception with the three military chapters, naturally leading to the question: “What does Ohio have to do with the military”? Several years ago, during sequestration, the Ohio Chapter reached out to the Air Force Chapter and invited them to participate in their local Chapter meeting. From there, the relationship grew and eventually the Ohio/TriService Chapter Reception has become a tradition at National ACP. We had a fabulous turnout and we all really enjoyed catching up with everyone. Those in attendance also heard a brief talk by Dr. Matthew Carroll (Air Force Chapter Governor) regarding pathways to FACP. If you are attending Internal Medicine in Philadelphia next year, check the meeting schedule for our reception! 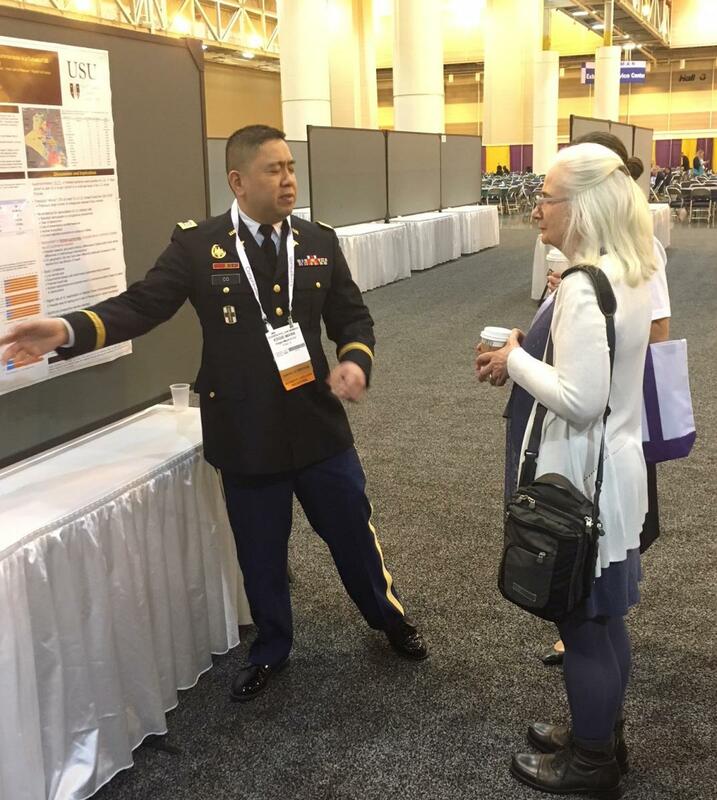 Three residents represented our Chapter in the Residents/Fellows Abstract Competition as Chapter level abstract winners: CPT Edgie-Mark Co from WBAMC with his research entitled: “A Stealth Parasite: Prevalence and Characteristics of Risks for Latent Visceral Leishmaniasis in a Cohort of US Soldiers deployed to Operation Iraqi Freedom”, CPT Kimberly Fabyan from WRNMMC with a clinical vignette on “Heartbreaking Cellulitis”, and CPT Cornelia Willis from MAMC with a QI abstract “Inpatient Emergency Department Admissions: One Institution's Response to The Joint Commission's ORYX Quality Measures”. 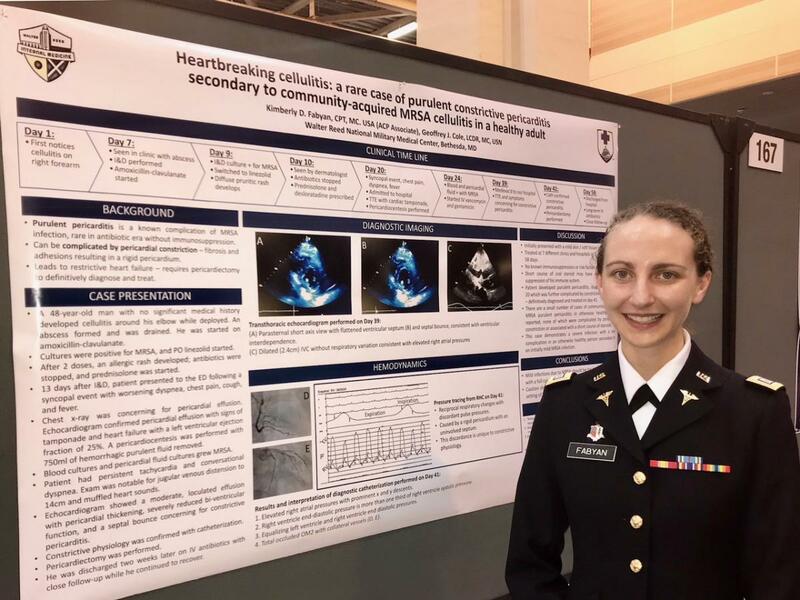 In addition to Chapter Winners, the US Army Chapter had a broader presence in the abstract competition with participation from CPT Aimee Moores (MAMC), CPT John Shumar (WRNMMC), CPT Brennan Cebula (MAMC), MAJ Jason Unger (WRNMMC). The Army Chapter also had a presence in the Exhibit Hall, with Governor's Council member and SAUSHEC IM Program Director, COL Joshua Hawley-Molloy working the recruiting booth. 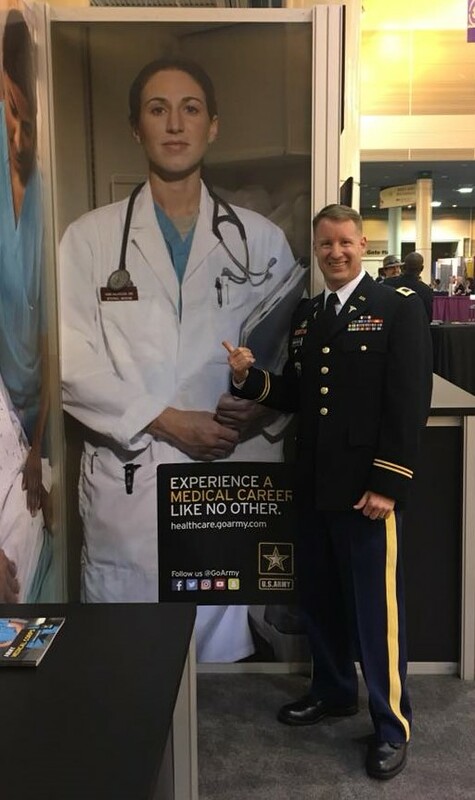 While he spent most of his time talking to conference attendees about Army Medicine, he wasn't alone, as several Army Chapter members are featured prominently in USAREC's MC recruiting materials! Finally, we had an exciting convocation ceremony with two new Fellows and two new Masters awarded. Although a mishap with the teleprompter caused the US Army Chapter to be left out of the convocation roll-call, LTC Scott Williams and MAJ Stephanie Grotzke were subsequently profiled in the next day's meeting wide news release. COL Lisa Moores and COL (Ret) Jennifer Thompson were named Masters in the College – a distinct honor! COL Lisa Moores was also awarded the prestigious Jane F. Desforges Distinguished Teacher Award. Our US Army Chapter meeting is just around the corner! We've combined with the US Air Force Chapter again for an outstanding program. The dates are 6 – 8 September at Joint Base Lackland in San Antonio, TX. This year, we will also pilot a Faculty Development Pre-course which will run the afternoon of 5 September at the Marriott Plaza San Antonio. The Pre-course is put on by USU and attendees will earn credit toward USU's Faculty Development Certificate. For more information about USU's Faculty Development program, you can access their newsletter. We've taken feedback from last year's program and expanded this year's agenda to include plenary talks on chronic pain management, global health and disaster medicine. We've added panel discussions on hot topics with three subject matter experts and we've added an Operational Medicine focus. This is in addition to the resident, fellow and early career physician abstract competitions, student welcome reception, Jeopardy throw-down and social hour and time to meet, greet and re-meet old friends! Registration is free, but there is no central funding available to support the meeting this year. Please look out for an upcoming email that will include a brochure and all the details you'll need to register for the meeting and the Pre-course. Information can also be found at our Chapter Website which will be updated as new details are available. Governor: LTC(P) Cristin Mount: LTC(P) Mount is an Intensivist and currently serving as the Deputy Commander Medical Services at Madigan Army Medical Center. She will hold the Governor's position until 2021. Treasurer: COL Jess Edison: COL Edison is the current program director for the Rheumatology Fellowship at Walter Reed National Military Medical Center and the OTSG Consultant for Rheumatology. Senior Internal Medicine Specialty Leader: COL Travis Richardson is board certified in Internal Medicine and is currently serving as the Internal Medicine Consultant to the Surgeon General, US Army and is the Service Chief for Executive Medicine at Walter Reed National Military Medical Center. Internal Medicine Residency Program Director: COL Joshua Hawley-Molloy is currently the Program Director of the SAUSHEC Internal Medicine Residency in San Antonio. In addition to his GME interest, he is an Infectious Diseases specialist with an interest in global health and LGBT health. Originally from Virginia, he enjoys running, travel, and hanging out with his kids when he's not at work. He and his husband Johnathon have a five year old daughter Kylie, an 18-month old son Kaelen, and two geriatric miniature dachshunds. USUHS Department of Medicine Representative: Louis Pangaro, MD, MACP will be stepping down this summer as Chair of Medicine at USU after ten years, and is thrilled that COL Kevin Chung will be his “relief”. Dr. Pangaro has just received the Hubbard Award from the National Board of Medical Examiners for his pioneering work in assessing clinical competence. Operational Medicine Representative: COL Ramey Wilson currently serves as the Command Surgeon for Special Operations Command-Africa (SOCAFRICA), which is headquartered in Stuttgart, Germany. In this role, he is the director for all medical care in support of Special Operations units operating in Africa. His focus is improving medical interoperability with European partners and building the medical capabilities of host nation military medical forces. Early Career Physician Representative: LTC Josh Hartzell is currently at the Uniformed Services University. He holds several roles including Assistant Dean of Faculty Development, Director of Internal Medicine Selectives, and Assistant Clerkship Director. Membership Committee Chair: MAJ Meredith Hays is a General Internist who has recently PCSd to William Beaumont Army Medical Center to assume the role of Internal Medicine Residency Program Director. Awards Committee Chairs: MAJ Robert Walters is the Interim Chief for the Division of Pulmonary/Critical Care at Brooke Army Medical Center. He currently serves as the Associate Program Director for the SAUSHEC Pulmonary/Critical Care Fellowship as well as the Army OTSG Consultant for Medical Ethics. He is a staff Pulmonologist at BAMC. 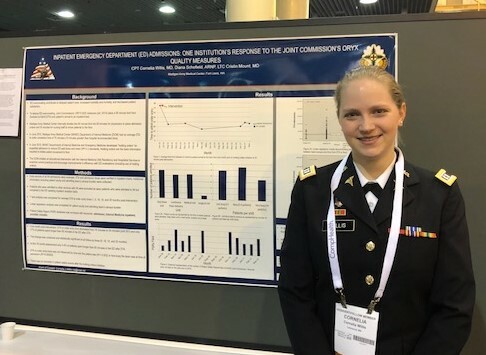 Education Committee Chairs (Annual Meeting Planning Committee Chairs):MAJ Tatjana Calvano is at BAMC, serving as the APD for the Internal Medicine Residency and Core Clinical Faculty for the ID Fellowship with a clinical practice as a staff Infectious Disease specialist. She also serves as a member of the Council of Early Career Physicians for the National ACP. 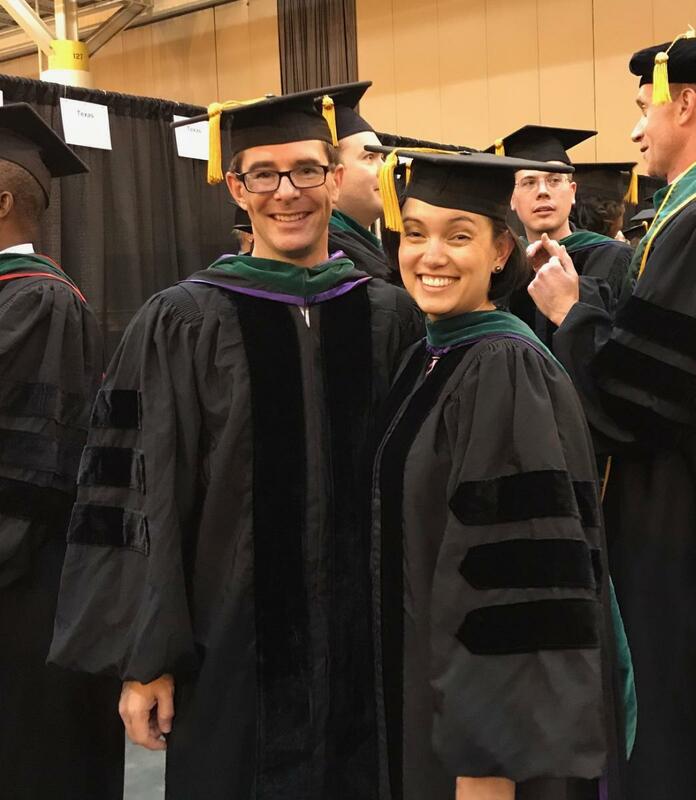 Chapter Wellness Champions: CPT Andrew Mertz is an Internal Medicine Resident at Walter Reed National Military Medical Center in Bethesda, MD. In addition to his medical responsibilities at Walter Reed, he serves as one of the Social Representatives from the residency program responsible for organizing social and wellness oriented events. His involvement in medical student and physician wellness started at the Uniformed Services University, where he was elected the Wellness Representative for his class and worked with the Office of Student Affairs to establish the USUHS Wellness Program in 2016. It was a privilege to attend this year's Well-Being Champion Training Workshop at the National ACP Conference in New Orleans. We were provided with numerous resources to enhance personal wellbeing and professional satisfaction in the healthcare workplace. Many of these resources can be found at this publically available website provided by the ACP . Our goal over the next 1-2 years is to educate our chapter colleagues about the importance of physician wellness in combatting burnout. 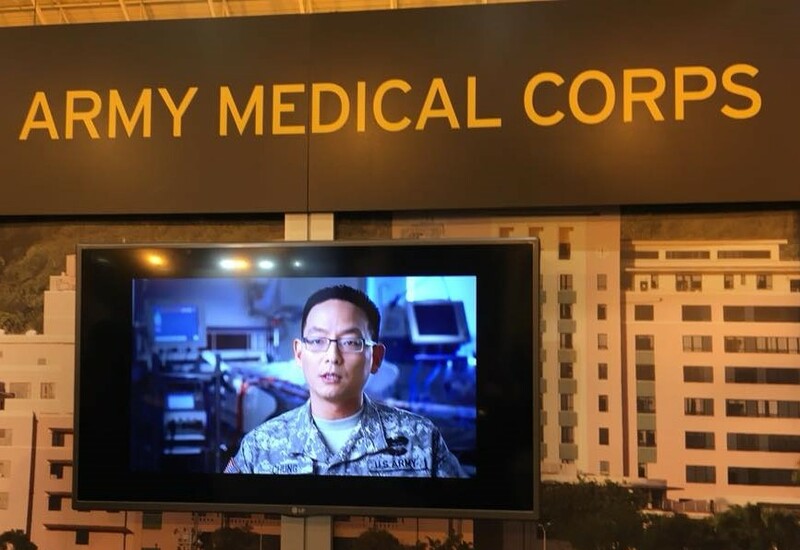 We also aim to serve as a resource for Army physicians across all MTFs who would like to implement physician wellness initiatives at their respective institutions. We plan to brief the chapter at our upcoming meeting in September 2018 and hopefully form a Chapter Wellness Committee comprised of interested physicians across the MTFs. Council of Early Career Physicians: The CECP is promoting a new guided pathway to fellowship that residency graduates should consider to help advance to FACP. 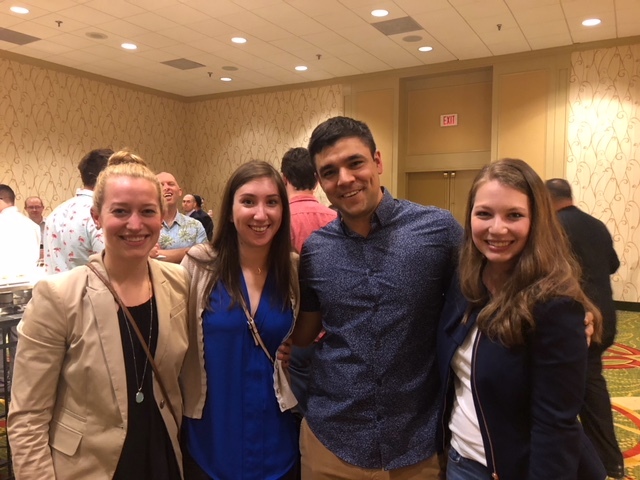 The CECP is also encouraging all ECP (physicians within 16 years of med school graduation) to actively participate in your local chapters to demonstrate involvement in the ACP. This is helpful to advance to FACP and to help with academic promotion as well. 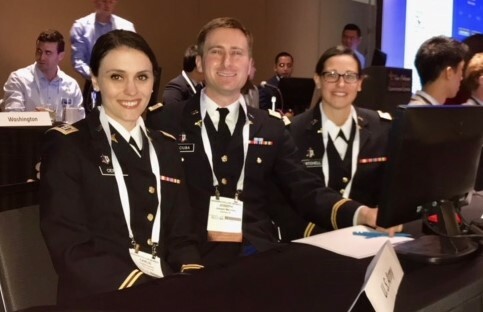 The Army Chapter is interested in starting our own Council of Early Career Physicians – if you are interested, contact LTC Joshua Hartzell or MAJ Tatjana Calvano for more information. Hope to see you in San Antonio in September 2018!